So how about those stellar numbers? Did you manage to make a lot of blocks in June? 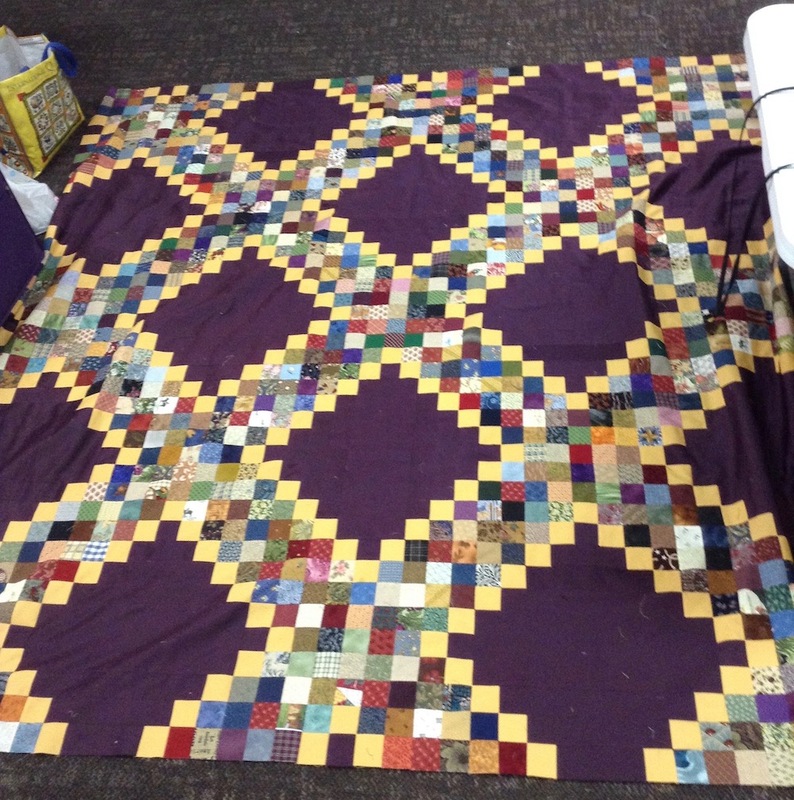 I got to go to a retreat last weekend, and I put on a veritable piecing marathon! I had several projects completely cut out and partially pieced, and I was on a mission to finish those tops. I finished FOUR of them while I was at the retreat, then promptly started an entirely new quilt, because I needed another UFO to add to my list! 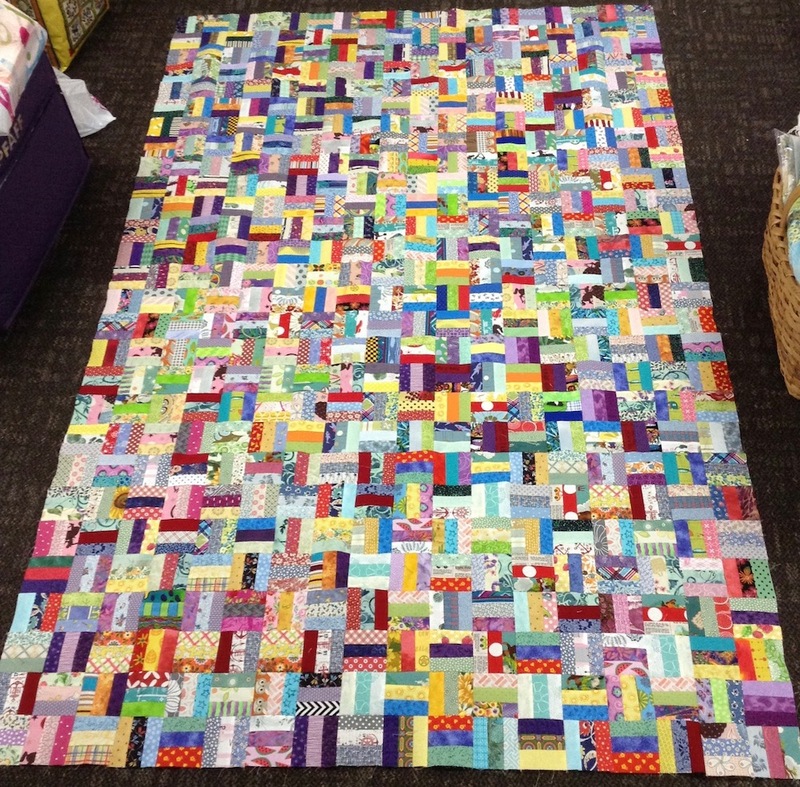 And I’ve completed 7 blocks for my Anthology quilt, which means I’m already behind, and having a hard time catching up. I’m sure my sister is right on schedule with all of hers. Here are the four quilt tops I finished at the retreat . . . 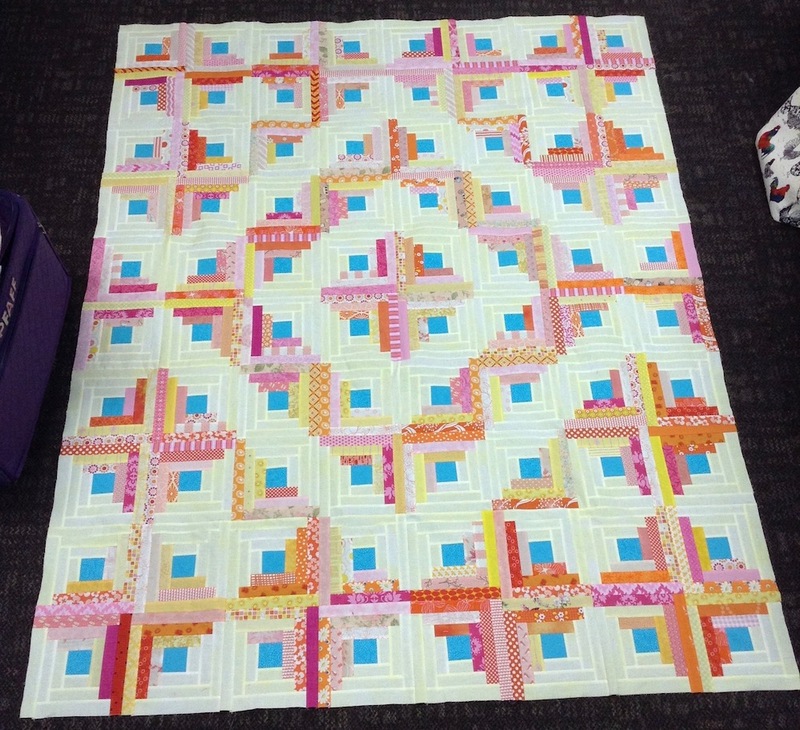 I made this pink/yellow/orange Log Cabin quilt using Sherri’s tutorial over at A Quilting Life. 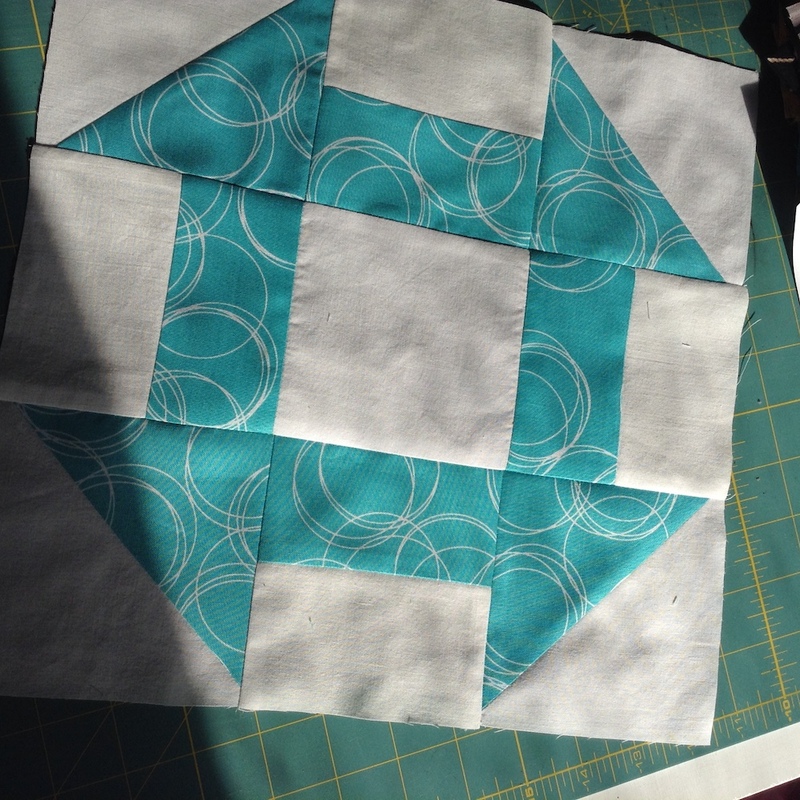 The turquoise centers gave the blocks just enough oomph! I’m excited to get this one quilted and completely finished. It has 80 blocks in it. One of my fellow retreaters, Tracy, was destashing some fabric at the retreat, and had the perfect piece for me to use for the binding, and just enough of it! The second top I finished was my “Heart-Crossed Throw Quilt”, from this tutorial by Jeni Baker. I had all the cross blocks finished, so it was easy to set it all together. I made mine larger than hers, trying to use up fabric, but it seriously didn’t even make a dent in my blue stash. Uff! 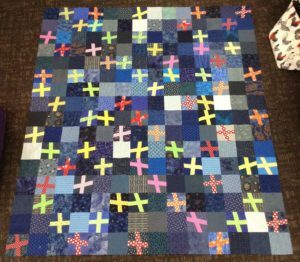 There are 74 cross blocks, which I counted individually, then simply counted each row as another block, for a total of 90 in this quilt. This third one isn’t completely finished, because I still want to add some borders, but the center is all put together, so the hard part is over! 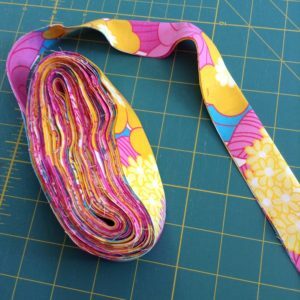 This was made from my own pattern, Forever Fencin’, so I could try to use up all my pre-cut 1 1/2″ strips in bright colors. Even tho I made it bigger than my original quilt, I still have lots of 1 1/2″ strips left, but at least the lid will close on the bin now! I’m counting each set of four Rail Fence units as a block, and there are 126 in this quilt. And the fourth quilt top I finished at retreat is this Scrappy Irish Chain, from a free pattern by Jesse Fincham. This is the second one of these I’ve made, trying to use up my scrap 2 1/2″ squares. 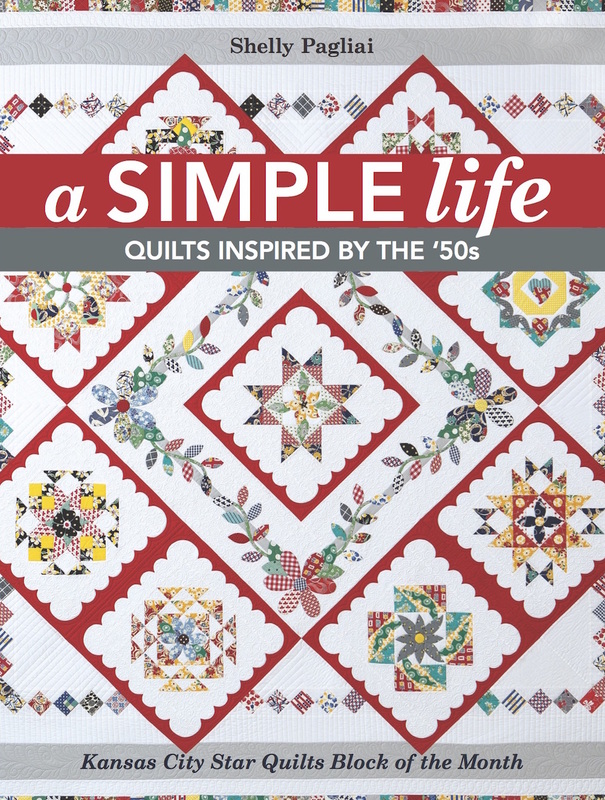 You can see other versions of this quilt, and get the information on how to obtain the free pattern HERE. It has 25 blocks. That leaves me with a total of 333 blocks for June! Whew! I’m not sure I’ll be able to have another month like that the rest of the year, but it doesn’t mean I won’t try. How about you? What’s your June number? Are you getting to sew? Or is summer keeping you too busy? It’s time to report in and let me know. I’ve updated the Project Page with our new goal for July, which is 29 blocks, for a year-to-date total of 216. The prize winner for May is Sherrie V.! Happy block making in July! Not a big quilting month for me with only 8 blocks but I did quilt a twin size and finished off a full size. I am working on two patriotic quilts that have larger blocks in them–12 per quilt, or 24 blocks to count. Between finishing three baby quilts and putting together some of my Grandma’s log cabin blocks into the middle of a negative space quilt, I’ll count an additional 4 blocks for the work on those projects. I have done a lot of practicing on my new longarm, so most of my time has been devoted to that! I think I can add a total of 28 blocks for this month. Only did 12 This month. Summer is very busy for me. well, you have had a very productive month! I only had 30 Blocks sewn this month which seems kind of low since I thought I sat at my sewing machine every day. But I guess not. I am in the middle of quilting a queen sized quilt on my domestic so that has taken up quite a bit of my time and started on a Trip around the World quilt and keeping on track with the Sewcial Bee Sampler. Well, I only got 47 blocks done this month, but I did get some quilt tops quilted and done, and I made two bags (1 big, 1 little). You, on the other hand, were cranking out projects like a ninja! What a great feeling that must be! Add 12 more to my total. Thanks! That reminds me. I’m still working on my king size hexie. So I need to add 80 more. I do them when we are at camp at night. It relaxes me. Put me down for 36. You were one smoking hot piecer this month, Shelly. Congratulations! I need to add another for my hexie quilt. Wow what a haul of block for you. I only managed 12 this month but there is a batch of block half finished which I haven’t count yet. WOW!!!! You sure were productive this month. I finished 164 blocks and quilted and bound seven quilts on my domestic machine. I have a deadline coming up quickly and still need to start and finish two more quilts to meet the deadline. As soon as I finish, I am looking forward to spending more time reading and less time sewing. What an amazing month Shelly – aren’t retreats the best! I went on retreat too, although not quite as productive as yours. 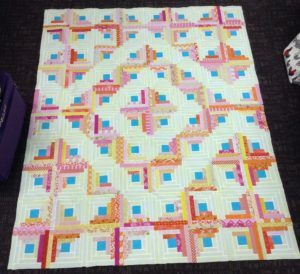 An assortment of blocks and 2 row quilts count up as 58 blocks. Wow! You were on fire this month. I really like all the quilt tops you finished or nearly finished. I made 92 blocks during July. I moved and started a new job in June and as a result I only completed eight blocks this month. 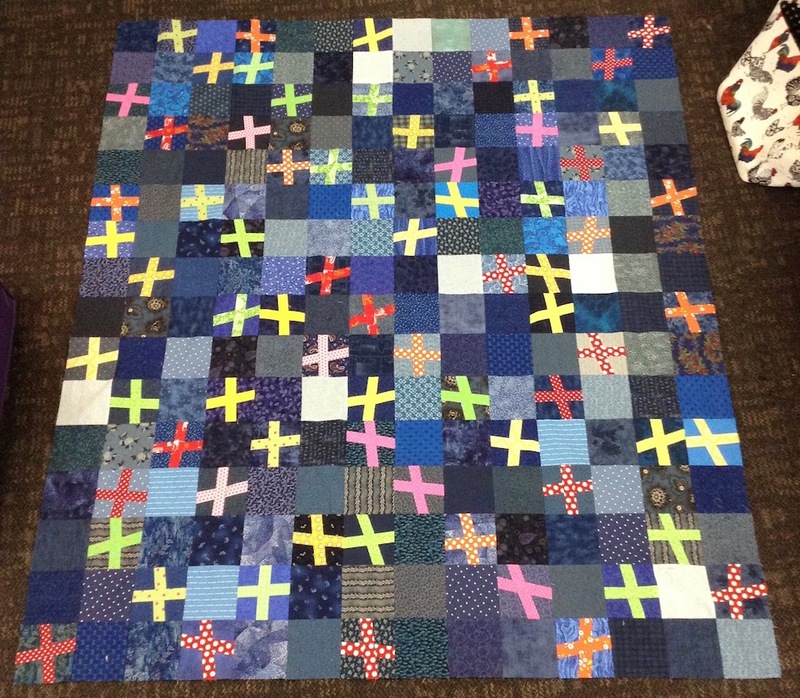 97 blocks this month….all for Quilts of Valor. 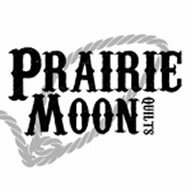 Company coming in July somImhad to finish up lots of started projects. A lot more quilting than piecing this month, but you don’t get a quilt unless you quilt it!! I also did a lot more cutting than piecing. Am sure July will be the same thing. I have completed 82 blocks for the month of June. This month I might be going out and getting some row-by-row license plates, so maybe not as much sewing. Counting for June is easy: 0. All sewing time was for my niece’s wedding dress. Now that the big day is over we can get back to the projects! By spending two days quilting with Kenzie, I managed to do 48 drunkard path blocks. I also did some Farm Girl Vintage blocks. And don’t forget the BOM from Sew Sweet that was designed by Shelly!!! (that’s you). I have a total of 93 for this month. 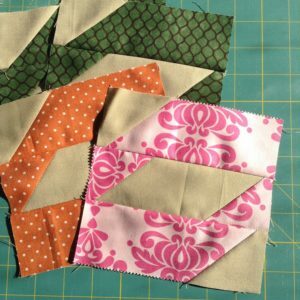 I started a new quilt – have it all cut out. I really have to move to quilting this stuff. The insanity continues. I have 69 blocks for May. I got a whopping 1 block for June. Hopefully I can get back in the sewing room in July. Congratulations due for fun work! so we see what will happen. I made 45 blocks in June. Some for family, some for myself. Wow, you made four quilt tops. They are really pretty. I completed 42 blocks in June. Whew! Your numbers make me want to go on a retreat. However, June was pretty good for me with 61 blocks. That makes 290 so far. Just 1 lonely block, it is 15″ using the pieces I have been building just couldn’t get enough time to sew them together. looking forward to more sewing time in July!! I have made a few tiny 9 patches for your scrappy block creation,Shelly looking forward to making the rest of the pieces. I spent a good bit of June making 500 + red/white 2″finished HSTS for a swap and partial blocks for my the Judy Niemeyer table runner class I took. Had planned on having the table runner finished by the end of the month but we all know how plans don’t always work out! I did get 8 more red/white Unity Blocks made plus 12 church dash blocks in kids prints or brights. So 20 for the month. Think that gives me 288 for the first 6 months. Will take it!!! Wow, that’s impressive!! Love your log cabin quilt. I got 53 blocks done in June, and put the last stitches in the binding of the wedding quilt in time to wrap it and bring it with us–so glad I wasn’t finishing it in the car! Buckled down and finished 73 blocks this month! Garden and longarm machine quilting have taken priority this month, but I did manage to get 13 blocks done!!! June block count is 5. My machine needs service, I was sewing with a bent needle on heavy denim – didn’t realize – so the poor machine has paid the price. 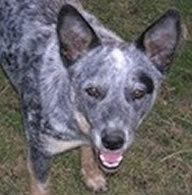 Then we went on a trip across Canada to see the kids. About 10,000 kilometers. Grand daughter turned 4. It was a good trip, but only got 5 blocks hand pieced. You are a very busy lady, all my best to you!! 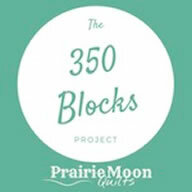 This month I have 86 new blocks, which brings me to a total of 627 for the year! 106 for June! Thanks to a retreat. 2 small jelly roll quilts, Autumn pumpkin quilt and 35 blocks for a border on a triple Irish chain quilt.